(CBS/AP) BAGHDAD - Iran made the first move Tuesday in attempts to gain an edge in nuclear talks with the U.S. and other world powers: It agreed in principle to allow U.N. inspectors to restart probes into a military site suspected of harboring tests related to atomic weapons. The tentative accord - announced as envoys headed to the Iraqi capital for negotiations - is likely to be used by Iran as added leverage to seek concessions from the West on sanctions. But U.S. officials have shown no willingness to shift into bargaining mode so quickly, setting the stage for possible tense moments after talks set for Wednesday resume in Baghdad's fortified Green Zone. Still, Iran's move raises the pressure on the West for some reciprocal gestures to keep dialogue on track and further highlights Tehran's apparent aims of opening a long give-and-take process over its nuclear ambitions. CBS News correspondent Elizabeth Palmer reports that Western diplomats are skeptical about the deal. They feel that Amano felt a lot of pressure to reach an agreement with Iran and that he came back from Tehran with a lot less than he should have. Not reaching a binding, comprehensive deal fell short of expectations generally. "This is not a final agreement," one European diplomat told Palmer. "It may be a basic understanding, so it may represent a certain success." While the contents of the agreement are not yet known among diplomats, it is unlikely that the deal will affect European and Western negotiators heading to the table in Baghdad, Palmer reports. By compromising on the IAEA probe, Iranian negotiators in Baghdad could argue that the onus was now on the other side to show some flexibility and temper its demands. Although Amano's trip and the talks in Baghdad are formally separate, Iran hopes progress with the IAEA can boost its chances Wednesday in pressing the U.S. and Europe to roll back sanctions that have hit Iran's critical oil exports and blacklisted the country from international banking networks. After talks in Tehran between Amano and chief Iranian nuclear negotiator Saeed Jalili, "the decision was made... to reach agreement" on the mechanics of giving the IAEA access to sites, scientists and documents it seeks to restart its probe," Amano told reporters at Vienna airport after his one-day trip to Tehran. Amano said differences existed on "some details," without elaborating but added that Jalili had assured him that these "will not be an obstacle to reach agreement." He spoke of "an almost clean text" that will be signed soon, although he could not say when. The United States is among those skeptics. In a statement released soon after Amano's announcement, Robert A. Wood, America's chief delegate to the nuclear agency, said Washington appreciated Amano's efforts but remained "concerned by the urgent obligation for Iran to take concrete steps to cooperate fully with the verification efforts of the IAEA, based on IAEA verification practices." "We urge Iran to take this opportunity to resolve all outstanding concerns about the nature of its nuclear program," said the statement. "Full and transparent cooperation with the IAEA is the first logical step." Israeli Defense Minister Ehud Barak also voiced doubts, saying the Iranians are trying to create a "deception of progress" to save off international pressure. "It looks like the Iranians are trying to reach a technical agreement that will create a deception of progress in talks in order to reduce the pressure ahead of talks tomorrow in Baghdad and postpone harshening of sanctions," Barak said during a discussion at the Defense Ministry, according to a statement from his office. "Israel believes that a clear bar should be set for Iran that won't leave room for any window or crack for Iran to proceed toward military nuclear capability," Barak said. "It's forbidden to make any concessions to Iran. World powers demands must be clear and unequivocal." "Enduring and substantial cooperation by Iran with the International Atomic Energy Agency to clear up the open questions surrounding the Iranian nuclear program would be an important and at the same time overdue step in the right direction," he said in a statement. On the Baghdad talks, "the aim is to make progress not just atmospherically but also on substance," he said, reflecting Western views that the feel-good effect achieved at a previous round in Istanbul last month must now be built upon with concrete steps aimed at reducing international concerns over Tehran's nuclear agenda. For the six powers  the United States, Russia, China, Britain, France and Germany  a main concern is Iran's production of uranium enriched to 20 percent, which is far higher than needed for regular energy-producing reactors but used for one Iran says it needs for medical research. The U.S. and its allies fear the higher-enriched uranium could be quickly boosted to warhead-grade material. U.S. officials have said Washington will not backpedal from its stance that Iran must fully halt uranium enrichment. But speculation is increasing that the priorities have shifted to block the 20 percent enrichment and perhaps allow Iran to maintain lower-level nuclear fuel production  at least for now. Iranian officials could package such a scenario as a victory for their domestic audience. In Israel, it would likely be greeted with dismay and widen rifts between President Barack Obama's U.S. administration and Israeli officials who keep open the threat of military action against Iran's nuclear sites. Israeli Prime Minister Benjamin Netanyahu has warned against concessions, saying world powers should make "clear and unequivocal demands" that Iran stop all of its nuclear enrichment activity. "Iran wants to destroy Israel and it is developing nuclear weapons to fulfill that goal," Netanyahu said at a conference in Jerusalem. "Against this malicious intention, leading world powers need to display determination and not weakness. They should not make any concessions to Iran." Jalili, Iran's top nuclear negotiator who met with Amano and will also be the lead envoy at the Baghdad talks, said his country hopes for a new beginning when the talks start on Wednesday. "We hope that the talks in Baghdad will be a kind of dialogue that will give shape to ... cooperation," Jalili said after arriving in Baghdad late Monday. 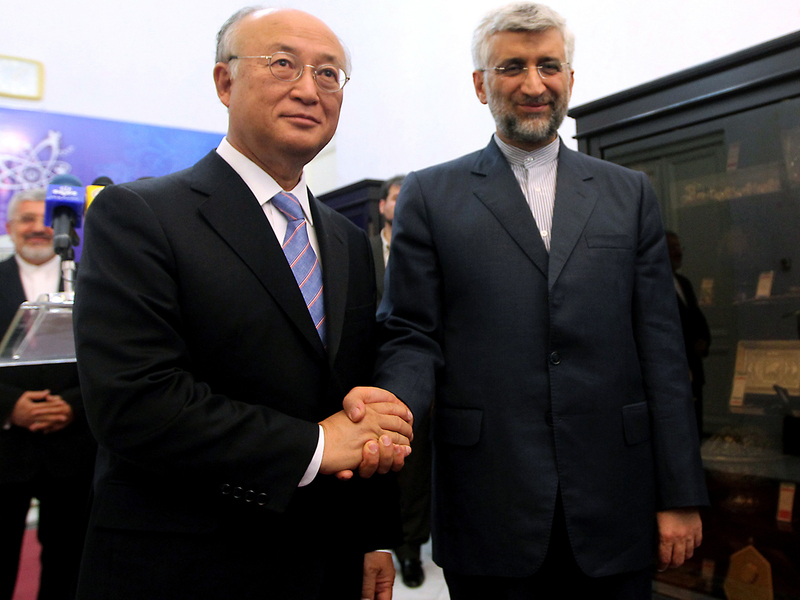 Amano's talks included Jalili as well as Iran's foreign minister and other officials including the head of Iran's nuclear agency, Fereidoun Abbasi. Iranian lawmaker Heshmatollah Falahtpisheh told The Associated Press on Monday that Tehran will likely accept more inspections of Parchin "if it feels there is good will within the (IAEA)." "In opening up to more inspections, Iran aims at lowering the crisis over its nuclear case," he said. "But if the sanctions continue, Iran would stop this." A political analyst in Tehran, Hamid Reza Shokouhi, said Iran is carefully watching to see if the West shows more "flexibility and pays attention to Iranian demands" during Amano's trip. "Then Iran will show flexibility, too," Shokouhi said.